Rotary clubs, like Nottingham, enable people to give some of their time to help make the world a better place under the ideal of 'Service above Self'. So we like to think that a little of the blood of our illustrious ancestor and his merry men and women still courses through our veins. It is sometimes difficult to make a difference on your own and it can get a bit lonely too. But when you are a member of the world's largest service organisation with 1.2 million members and 33,000 clubs in 200 countries, you can achieve great things together and it can be very rewarding. We are also proud of the fact that 100% of what we raise goes to the good causes we support. 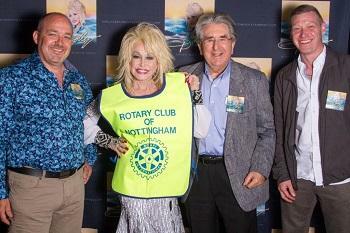 Like the project Leni Gelblum and Peter Moore are running for our club to raise £250,000 to register half of Nottingham's under-fives on the Dolly Parton Imagination Library Scheme to support literacy in the City. In 2012 it won them a Community award.